I was having a discussion here with a colleague about the merits of powering a high brightness LED (HBLED) using pulsed power versus using steady state DC power. So instead of continuing our debate we ran a quick experiment. 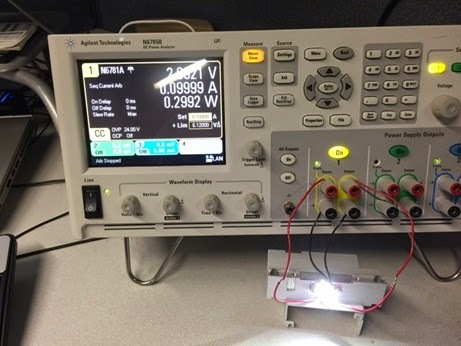 I happened to have some HBLEDs so I hooked one up to an N6781A DC source measure module housed in an N6705B DC Power Analyzer sitting at my desk, shown in Figure 1. 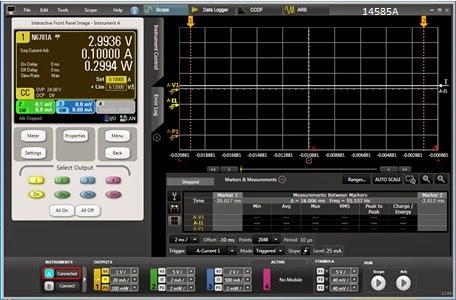 The N6781A has excellent current sourcing characteristics regardless whether it is DC or a dynamic waveform, making it a good choice for this experiment. First we powered it up with a steady state DC current of 100 mA. At this level the HBLED had a forward voltage drop of 2.994 V and resulting power of 0.2994 W, as seen in Figure 2, captured using the companion 14585A control and analysis software. We then set the N6781A to deliver a pulsed current of 200 mA with a 50% duty cycle, so that its average current was 100 mA. The results were again captured using the 14585A software, as shown in Figure 3. Switching back and forth between steady state DC and pulsed currents, my colleague agreed, the brightness appeared to be comparable (just as I had expected!). But something more interesting to note is the average current, voltage, and power. 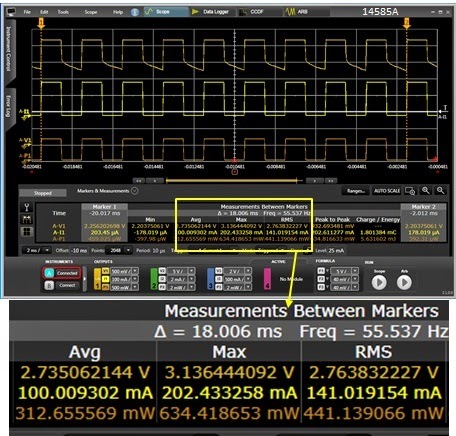 These values were obtained as shown in Figure 3 by placing the measurement markers over an integral number of waveform cycles. The average current was 100 mA, as expected. Note however that the average voltage is lower, at 2.7 V, while the average power is higher, at 0.3127 W! At first the lower average voltage together with higher average power would seem to be a contradiction. How can that be? First, in case you did not notice, the product of the RMS voltage and RMS current are 0.3897 W which clearly does not match our average power value displayed. What, another contradiction? Why is that? Multiplying RMS voltage and RMS current will give you the average power for a linear resistive load but not for a non-linear load like a HBLED. 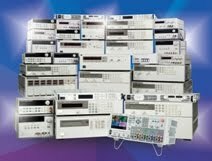 The average power needs to be determined by taking an overall average of the power over time computed on a point-by-point basis, which is how it is done within the 14585A software as well as within our power products that digitize the voltage and current over time. Second, the average voltage is lower because it drops down towards zero during periods of zero current. However it is greater during the periods when 200 mA is being sourced through the HBLED and these are the times where power is being consumed. So here, by using pulsed current, our losses ended up being 4.4% greater when powered by the comparable steady state current. These losses are mainly incurred as a result of greater resistive drop losses in the HBLED occurring at the higher current level. There is supposed to be one benefit however of using pulsed power when powering HBLEDs. At different steady state DC current levels there is some shift in their output light spectrum. Using pulsed current provides dimming control while maintaining a constant light spectrum. This prevents minor color shifts at different illumination levels. Although I would probably never notice it! Read the following article about vocational schools. This maybe the best choice for your future career!